The Free World must stand up to China’s 21st century tyranny. Martin Luther King Jr.'s critique of the "white moderate" is especially relevant to the College. The culture of "#bookstagram" is damaging to the community's mission. In the 12th installment of Mixed from Maine, Cecilia Morin '21 predicts the forecast for week 3 of the term. Cyntoia Brown and the case for sentencing guideline reform. And where you can no longer find them. The relationship between the town and the College is far from settled. 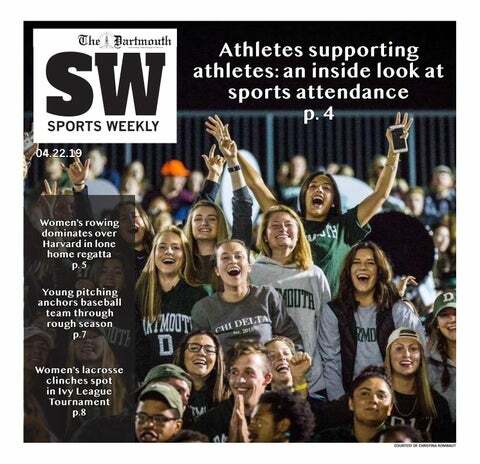 The Dartmouth tradition is a strange and good one. David Velona '21 provides commentary on current presidential battles. It's wonderful until it hits you. Theory-inspired clothing makes philosophy a part of our everyday lives. New Hampshire’s primary could offer activists a useful spotlight. Holzer: No Host? No Problem. In their fight against falling ratings, awards shows have sacrificed their integrity. 2018 was a challenging year for the freedom of the press. As the College finds itself in another scandal, Lamees Kareem illustrates how many alumni are feeling. In the eleventh chapter of her series "Mixed from Maine," Cecilia Morin '21 reflects on the stages of Winterim many students are familiar with. Life insurance premiums should not depend upon fitness tracking. Fear of repercussion prevents students from claiming agency. Dartmouth women deserve more than empty promises.